Way I read it azeotrope ethanol is as high proof purification as can be done by distilling. Meaning anything heavier than ethanol has been removed. Not sure what the other 5% is though..
valkorum wrote: My neighbour (unna) and I did a double distil TPW run yesterday. Here are our findings. We have kept the heads and leftover low abv strip run for a future feints run. * We cut some down to 40% and drank as a vodka there and then - wow. Both of us have never tasted a neutral vodka like that before. * This was our first double distil TPW so we were unsure as to where the cuts would be. Our cuts were made by taste and smell only. * We actually ran a parot and found that the ABV was pretty much 100% the whole run. Once it started to drop (and the temperature started to rise), we found we were in tails. Heads and hearts were at the same temperature and same abv. * For those that are interested the temperature was 78.7 for the heads/hearts run. Once the temperature started to rise, it rose really quickly. * The spirit run took quite a while. 1 hour to heat up, 4.5 hours to collect foreshots, heads and hearts. We didnt collect all the tails as it was late and we already had 6L of feints collected, so we just shut it down. I have to say, everyday that I spend reading on this site the more I learn & change (for the better)! Last week I was going to buy an air still and turbo wash for the rest of my life (after my extensive research on google and youtube). Now I have seen the light :pray: and looking to purchase a Pure Distilling Reflux still, TPW and double distill everything ha ha. Can't wait to see where else this takes me! Just about finished the annual 200L TPW for the dragon's "vodka" - pot still x 4 runs, then run it all through reflux. The stuff drinks like water at 40%. Way better than anything I produced with a single reflux run. wedwards wrote: Just about finished the annual 200L TPW for the dragon's "vodka" - pot still x 4 runs, then run it all through reflux. The stuff drinks like water at 40%. Way better than anything I produced with a single reflux run. What's your expected yield in low wines and then spirit run? Spirit run currently looks like this. 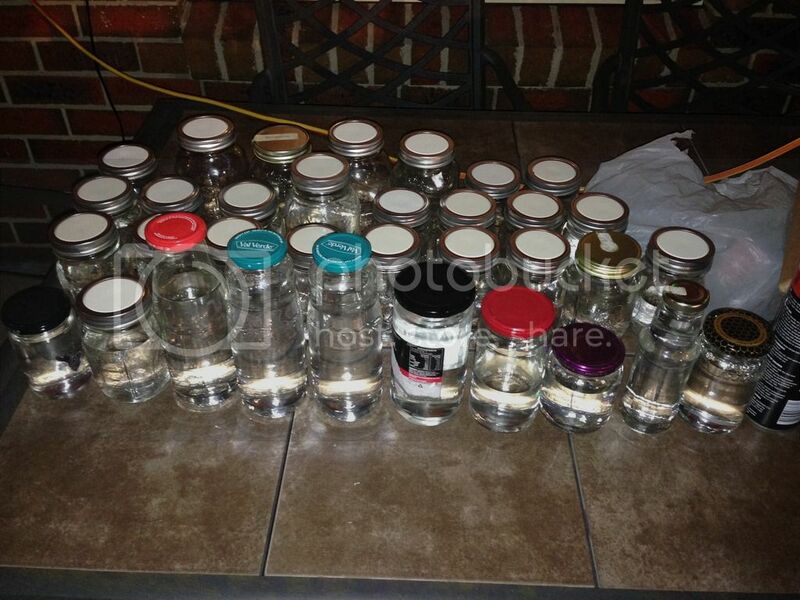 Forgot the dragon had used some of my mason jars for preserving so I'm down to any glass jars i could find. Most of the jars are 2 thirds full or more as Im pretty spot on with this old rig now, and know exactly where everything falls. Just thinking we need to do this! As in this qty wise! Only done 60L so far on a single run... Been told to do double distillation and need more volume!!! The last few 40L TPW's i have done has been strip run in a 1M reflux still with stainless wool removed. Then spirit run with reflux stainless in, feints in the boiler and harsh cuts. I'm getting nice product with no filtering. Happy days. Hi all, I'm a total noob to this double distillation but I'm also extremely keen. I've managed a couple of stripping runs and currently have in storage about 18ltrs @ 50%, with an aim to getting to 25ltrs for a spirit run. Just one question I'm hoping you can give me some advice. For the spirit run, should the % be 40% or 50% with my humble alcometer, are there any pros or cons to either or is it just personal preference. I'll have enough for a spirit run after my next strip but would obviously get there a little sooner if 40% spirit run is used with a lower yield on the spirit run. Bluc, if u have a read of the stuff below, you may see that there are a 'lot' of dodgy things in our wash that are VERY hard to remove completely, and as Kal explained, 'azeo' as we know it is merely the best proportion of eth/water mix we can hope to achieve.It does not guarantee purity. I hope this 'clip' doesent do too many heads in. A by-product of carbohydrate fermentation to produce ethyl alc. The material varies widely in composition, depending on the fermentation raw material used, but contains chiefly isopentyl alcohol and 2-methyl-1-butanol as well as isobutyl alcohol(20%), n-propyl alcohol(3-5%), and small amounts of other alcohols, esters and aldehydes. Described as an oily liq with a disagreeable odor; 60% boils at 122-138°. Amyl alcohol (commercial) obtained by chemical treatment and refining of fusel oil contains about 85% isopentyl alcohol and 15% 2-methyl-1-butanol. Ref: Industrial Chemicals, W.L. Faith et al. Methyl alcohol; carbinol; wood spirit; wood alcohol. Flammable, poisonous, mobile liq. Slight alcoholic odor when pure; crude material may have a repulsive, pungent odor. Burns with a non-luminous, bluish flame. bp 64.7°. mp -97.8°. Caution: Poisoning may occur from ingestion, inhalation or percutaneous absorption. Acute Effects: Headache, fatigue, nausea, visual impairment or complete blindness (may be permanent), acidosis, convulsions, mydriasis, circulatory collapse, respiratory failure, death. Death from ingestion of less than 30ml has been reported. Usual fatal dose 100-250ml. Chronic: Visual impairment, cf.Patty's Industrial Hygiene and Toxicology vol. 2C, G.D.Clayton et al. pp 4528-4541.
; ethyl alcohol. Clear, colorless, very mobile, flammable liquid; pleasant odor; burning taste. Absorbs water rapidly from air. bp 78.5°. mp -114.1°. Solidif below -130°. 2-methyl-1-propanol; isopropylcarbinol; 1-hydroxymethylpropane; fermentation butyl alcohol. Colorless, refractive liq; flammable; odor like that of amyl alcohol, but weaker. bp 108°. mp -108°. 3-methyl-1-butanol; isoamyl alcohol; isobutyl carbinol; primary isoamyl alcohol; fermentation amyl alcohol. Liquid; characteristic, disagreeable odor; pungent, repulsive taste. Vapors are poisonous! bp 132.0°. mp -117.2°. Caution: May be moderately irritating to mucous membranes. High concns may cause CNS depression, narcosis; lower concns, headache, dizziness. Active amyl alcohol; dl-sec-butyl carbinol. One of the major components of fusel oil. Liquid, bp 128°. dl-sec-Isoamyl alcohol; sec-isopentyl alcohol; isopropyl ethyl carbinol. Liquid, bp 113-114°. Fusel oil component. Binary azeotrope having a distillate composition of 95.57% ethyl alcohol (by wt) and bp 78.15°C. Also specified as containing 94.9% by vol or 92.3% by wt of ethyl alcohol at 15.56°C. See U.S.P. XVIII, 20, 1067(1970). d 0.816 at 15.56°C (60°F). Pentyl alcohol; n-amyl alcohol; n-butyl carbinol. Liquid, mild characteristic odor. bp 137.5°C. mp -79°C. Slightly soluble in water (2.7g/100ml at 22°C); misc with alcohol, ether. LD50 orally in rats: 3030mg/Kg, P.M.Jenner et al., Food Cosmet. Toxicol. 2, 327 (1964). Toxicity: Irritating to eyes, respiratory passages. Narcotic: E.Browning, Toxicity and Metabolism of Industrial Solvents (Elsevier, New York, 1965)pp 356-367.
dl-sec-Amyl alcohol; methyl propyl carbinol. Liquid, characteristic odor. bp 119.3°C. Slightly soluble in water (16.6g/100ml at 20°C). Miscible with alcohol, ether. Caution: see 1-Pentanol. Diethyl carbinol. Liquid, characteristic odor. bp 115.6°C. Slightly soluble in water (5.5g/100g at 30°C); sol in alcohol, ether. LD50 orally in rats: 1870mg/Kg, Smyth et al., Arch. Ind. Hyg. Occup. Med. 10, 61 (1954). Caution: see 1-Pentanol. As you can probably see from these brief descriptions, methanol appears to be one of the most toxic of all. In fact the other alcohols by and large appear to have much the same effct as ethanol when consumed (with much greater activity/toxicity), except methanol which has some toxic metabolite (formaldehyde) which is somehow toxic to the optical nerves of the eye. Ethanol administration is actually used to slow down the metabolism of methanol when it's accidentally consumed!! Note the Merck note about Chronic effect (long-term use) of methanol being visual impairment; does this occur to heavy drinkers?!? That's the reason we do cuts. Can you, or any one explain the reason for this? pretty sure cause the temp need to ignite ethanol is around 350c and you elements are a lot hotter then that so by diluting it there is too much water to ignite? Above 40% ABV ethanol is flamable. Most if not all OP spirits are sold with a metal mesh disc that covers the bottles opening, this is to stop flames getting in the bottle. Think olden days mining lamps of a candle in a cage. It is also why absinthe burns as it is usually around 50% ABV (brand depending), when the flame dies out its back to around 40%.